"I recently purchased a 2018 Grady-White Marlin 300 at Port of Egypt Marine with the assistance of Mike Kelley. This was an exciting moment for us as we moved up from a smaller open boat to the Marlin 300. After deciding on the Grady-White, my wife and I took the time to visit the plant where we received a professional welcome and complete factory tour. Our entire experience working with Grady-White, Port of Egypt and Mike Kelley was exceptional. While working with Mike we became acquainted with the entire team at Port of Egypt and can attest to the great culture that exists there. Everyone was responsive and professional at every step of the way from purchase, delivery, demonstration, lettering, and installation of the electronics package. The organized and clean condition of POE attests to their attention to detail and we have already seen this regarding the commissioning of our boat and the first maintenance after the 20-hour break in period. If you are considering the purchase of a top quality boat I can honestly recommend Grady-White and encourage you to work with Mike Kelley and the exceptional team at Port of Egypt." 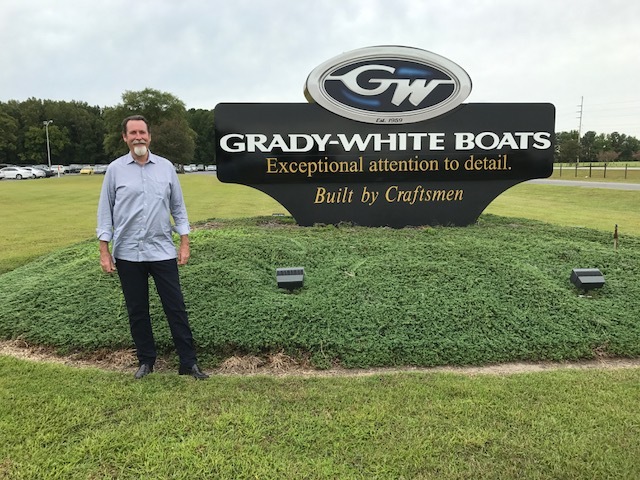 PHOTOS: (On left) Stuart Andrews in front of Grady-White headquarters in Greenville, NC, when he and his wife Karen visited for a factory tour before buying their Marlin 300. (On right) Karen and Stuart during their delivery demo with our CEO Bill Lieblein (far left). A big thank you to you and your team for setting us up with our 235 Freedom last Thursday. From the start of our process with Don Chattaway back in the fall of 2017 through our instructional with you last Thursday, we were impressed with each and every interaction my family and I had with your POE team members. We enjoyed our time with you during the first few hours we spent on our new boat. Thank you for being such a great partner. Look forward to many more years of fun on the water and will look forward to a long partnership with you and the POE team." "Seven Grady-Whites responsible for countless family memories! Thank you, POE." "The Lieblein family and staff at Port of Egypt Marine always made us feel at home in Southold. I can't get enough of the in-water instruction from Bill. The best two moments in boating? The moment you buy the boat and moment you sell the boat. I agree with that statement and POE makes sure I enjoy this over and over again. Thank you for many good times and all the best for the next 65 years. Seven Grady-Whites responsible for countless family memories! Thank you, POE." "WE could not have been happier with your marina". I just wanted to let you know how much we appreciated all of your help with our boat purchase. We absolutely LOVE the boat and could not have been happier with you and your family's marina. You guys have a great business out there and are such a pleasure to work with. Simply put, thank you . . . and we look forward to doing business with for years to come. "You have made the experience of purchasing a boat at POE, once again, a great one!" I would like to personally thank you for all of your support and effort in the execution of my recent purchase and outfitting on my new Grady-White 360 Express. I appreciate all of the time you put into researching open items, keeping me informed of the progress on a daily basis, and your attention to details in my absence. You have made the experience of purchasing a boat at Port of Egypt, once again, a great one! "you went far above our expectations . . . "
We just wanted to say thank you very much for making our buying experience wonderful. As you know, we purchased the 1999 Stamas that you were brokering. After we agreed on the pricing, you guys went far above our expectations in the sea trial and again with the walk through and docking lessons. Bill's very informative and amusing 'show and tell' session regarding the ins and outs of the boat, motors, and the options proved to be invaluable. Thank you also for the nice gifts you included during the closing. Our whole family enjoyed the visits to the marina. The trip back to Moriches in the new boat was just great and we have already enjoyed a weekend excursion. "You treated us like we had spent 10 million dollars on a boat, and all we did was buy a used 28 footer." I wanted to thank you for the personal "Sea Trial" you gave us when we bought our Grady White Sailfish from you. I know you have given hundreds of Sea Trials, but you were so thorough, and so careful, and so caring. You treated us like we had spent $10 million on a boat and all we did was buy a used 28 footer. We appreciate your guidance and experience to protect us while out on the water. That "Sea Trial" was weeks ago, but when we lost both engines while coasting in the Glen Cove Harbor, across the Sound from our home port of Rye, you were calm and helped us start our engines to make it home before dark, on the Eve of the 4th of July, no less. "DISTANCE HAS NEVER BEEN A FACTOR IN OUR RELATIONSHIP over the past four years." Well here it is, the end of another Boating Season. I want to let you know both Vera and I love our Grady 33'. I would like to thank you for "being there" for all the occasions when I had immediate need for various problems. Your Service Department has always been "there for me." It's reassuring to know that distance has never been a factor in our relationship over the past four years. "You and your family at Port of Egypt definitely go the extra mile." I want to take a moment to express my sincere appreciation to you and your family for the delightful day yesterday. The purchase of the Bimini 306 was handled with exceptional professionalism and great attention to all of the important details! 'Uncle Bill' gave me a comprehensive and enjoyable education on all of the systems and every inch of the Bimini from bow to stern. His extensive boating knowledge, coverage of basic vessel safety and operation, review of frequently made mistakes to avoid, as well as his friendly demeanor and sense of humor made for a memorable afternoon! You and your family at Port of Egypt definitely go the extra mile with personalized attention, friendliness, and follow through on all levels, all of which was greatly appreciated and above and beyond what might reasonably be expected. Thank you all very much!